...and so are my Lady Banks miniature roses. 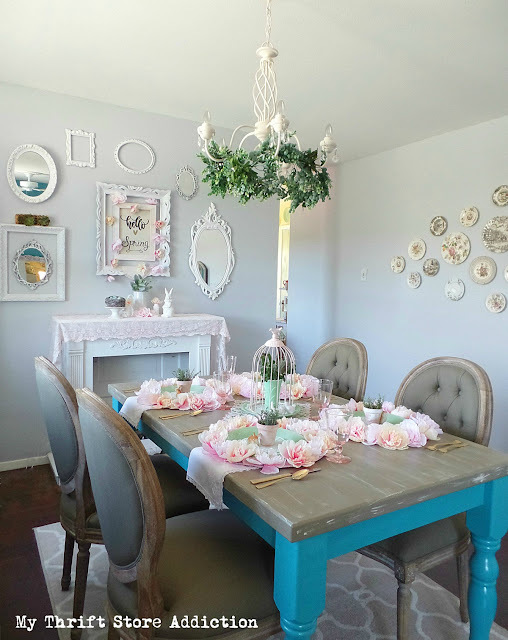 my spring home tour, featuring a blush and jadeite tablescape. 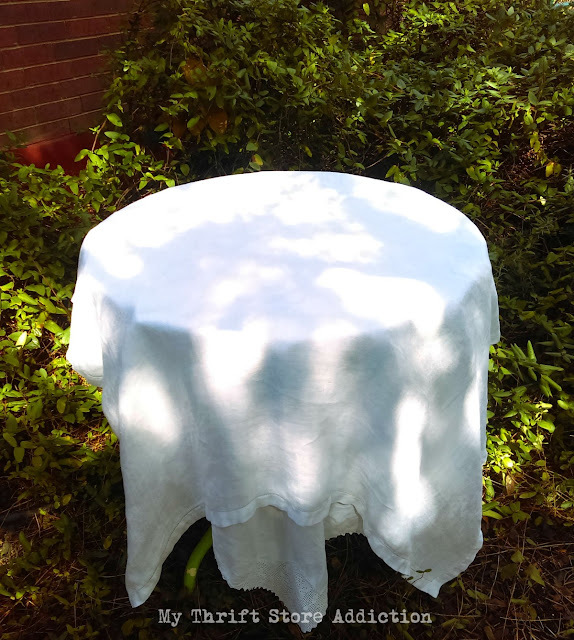 Today we're heading outside to the garden, where I've layered a few of my thrifted vintage white tablecloths in a sun-dappled spot surrounded by the lush greenery of honeysuckle vines. I've been excited to feature these gorgeous vintage Spode Sunflower plates I scored during my thrifting adventures last month. When I spied them at the end of the aisle, I made a beeline and was thrilled to find them in perfect condition. 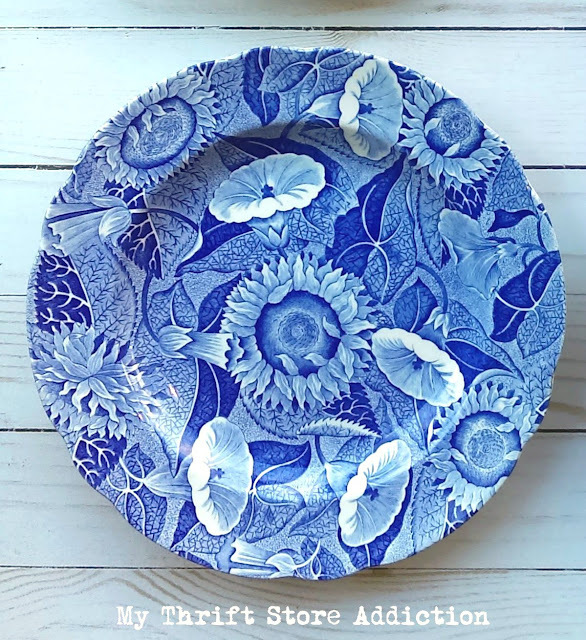 Dishaholic that I am, I love discovering a pattern I haven't seen before, and these from Spode's Blue Room Collection were new to me. 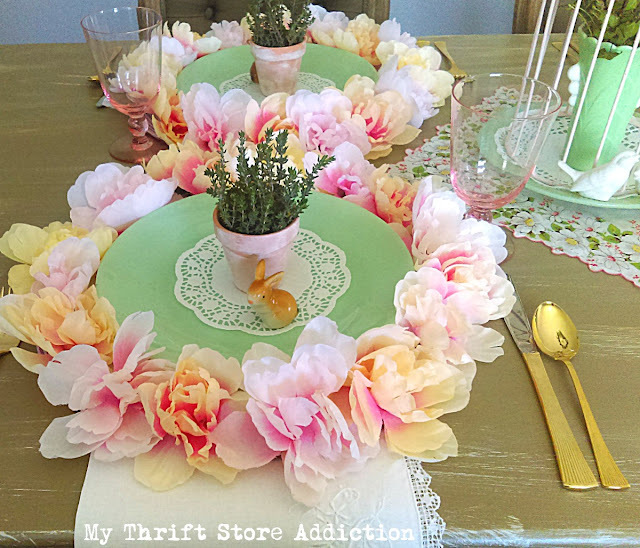 I shopped my home for the rest of the tablescape, choosing vintage Fire-King tea cups, copper handled flatware and natural woven placemats for texture. 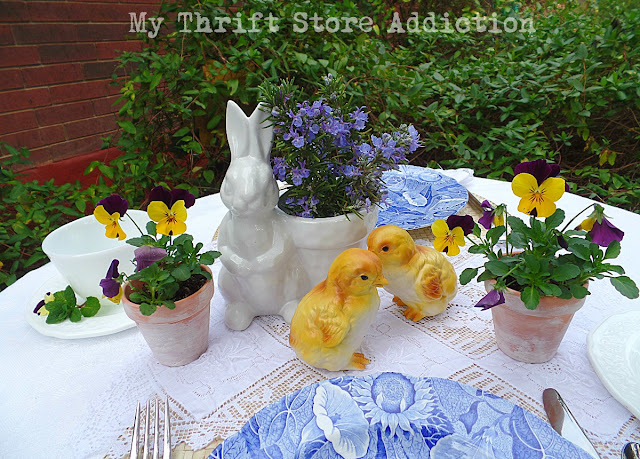 The lace napkins and vintage chicks are also thrift store finds. 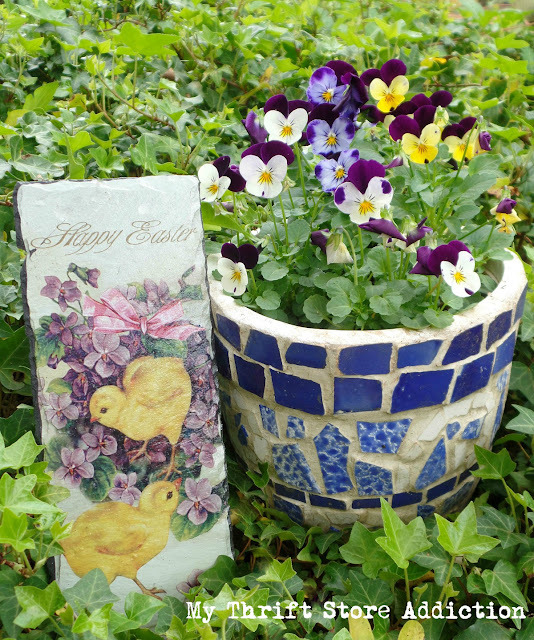 Next I shopped my garden, adding fresh rosemary to my bunny vase and tiny pots of violas that I gave an aged patina with white chalk paint. I really enjoy setting a table out in the garden surrounded by nature. The crisp blue and white is a lovely contrast to the surrounding greenery. ...celebrating the Risen Cross is my true Easter Joy! He is risen! Thanks so much for dropping by today! I hope you'll hop over to visit Debra at Common Ground. I know you'll enjoy her charming style! Below is the rest of the line up for today and tomorrow. Enjoy and remember to come back Friday for the link party! What a gorgeous tablescape. I adore the vintage chicks. They are so sweet. Your Lady Banks roses are just wonderful. Happy Holy Week! Those dishes are so special! Just gorgeous with the sunflower and shades of blue...two of my favorite things. Absolutely beautiful! I can't wait for spring to be that advanced here in Ohio. So thankful that He is Risen! This is adorable, Cecilia! 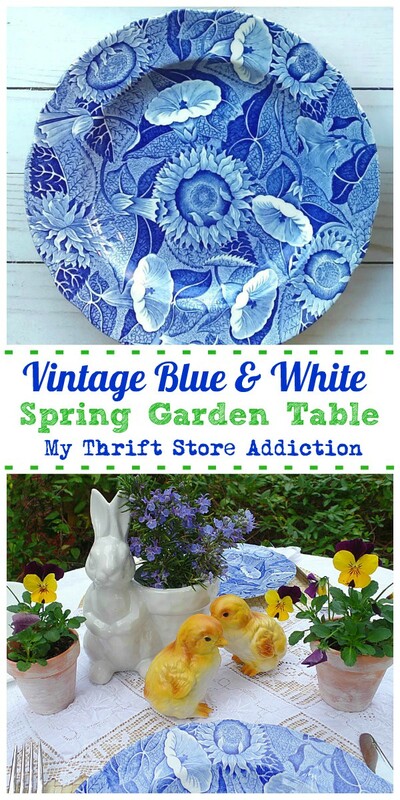 Love the blue and white with all the beautiful green of your garden surrounding it! So nice to see someone else's yard with something other than snow! Pinned! Your table is so lovely, Cecilia...I love the Spode plates! The little chicks are so cute! Absolutely gorgeous Cecilia... 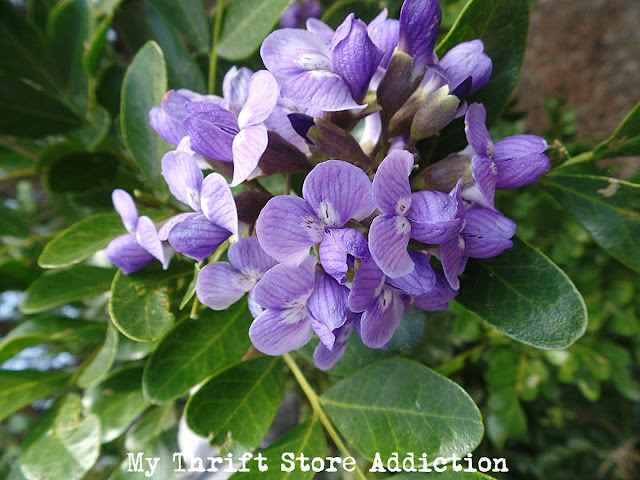 I love all the lovely spring colors! 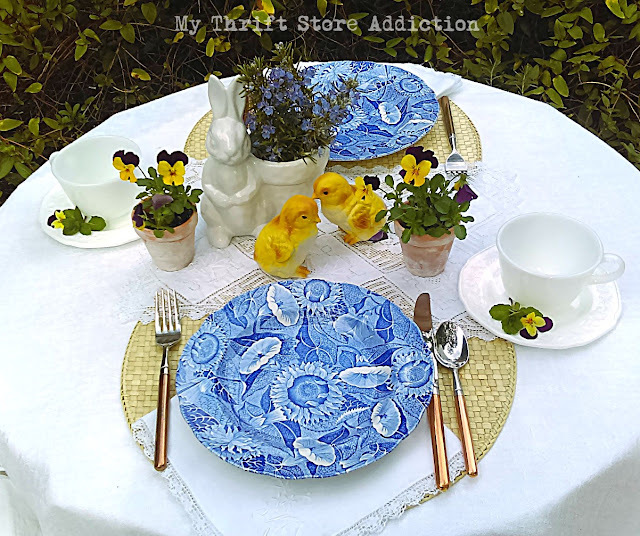 I'm in love with those amazing Spode dishes, the sunflowers make a gorgeous tablescape! 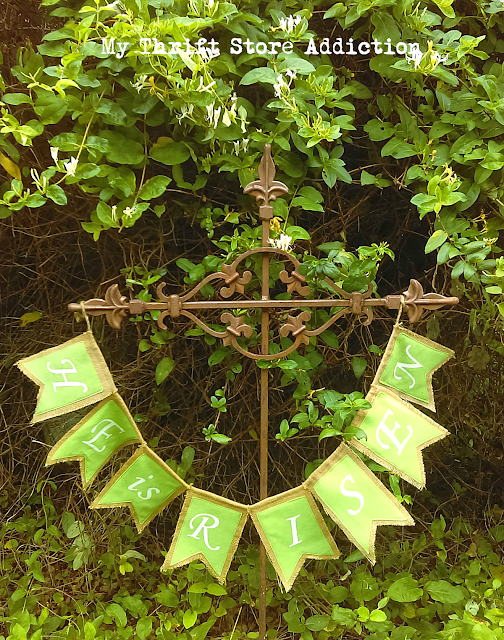 Beautiful cross with the Banner, and all your wonderful Spring Garden decor! Beautiful table with those wonderful Spode dishes. Everything looks lovely. 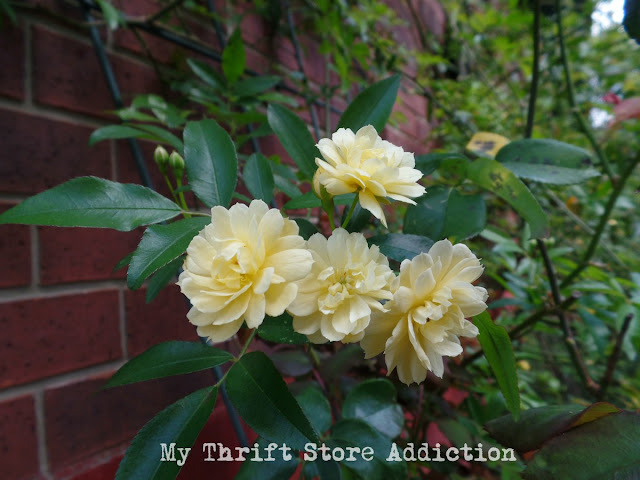 From one flower lover to another, Beautiful! 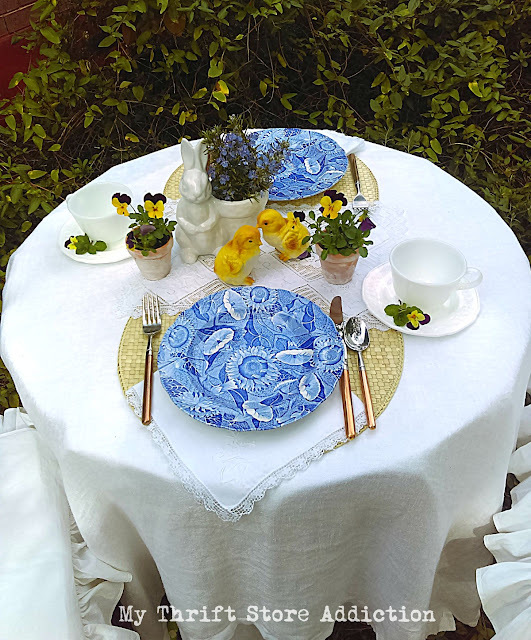 Cecilia, to say I'm a little jealous of your ability to have an outdoor tablescape this early in the season, and to have scored those sunflower plates is an understatement! Your vintage charm (😉) is oozing, both in your tabke now and in recent posts. 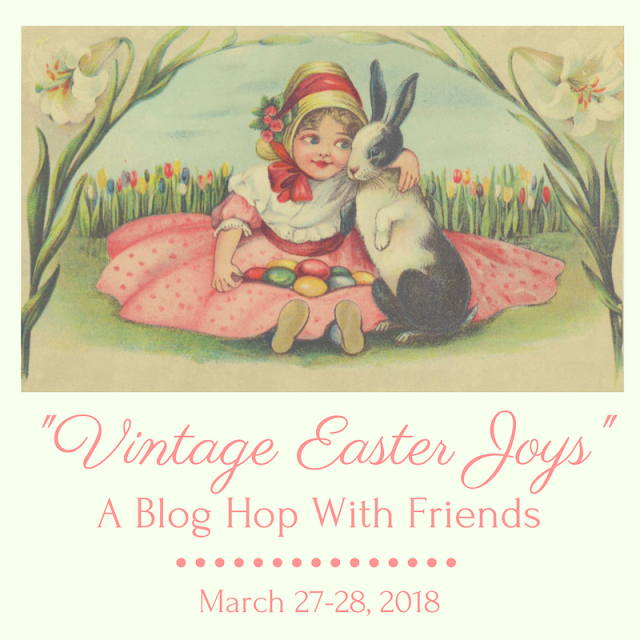 It's always a pleasure to visit friends with like interests, but to share this blog tour with you is a special Easter Joy for me. Oh my goodness, those Spode dishes are outstanding. Has this red girl dreaming of blue! I bet evem leftovers would taste gorgeous eaten in your beautiful setting! I was envying you the greenery as we still have lots of snowbanks. The only thing that thinks it's mud season is the driveway! I bought an Easter lily that should bloom by Sunday to bring to church! Happy Easter! Your garden is pretty, and I LOVE your dining room. 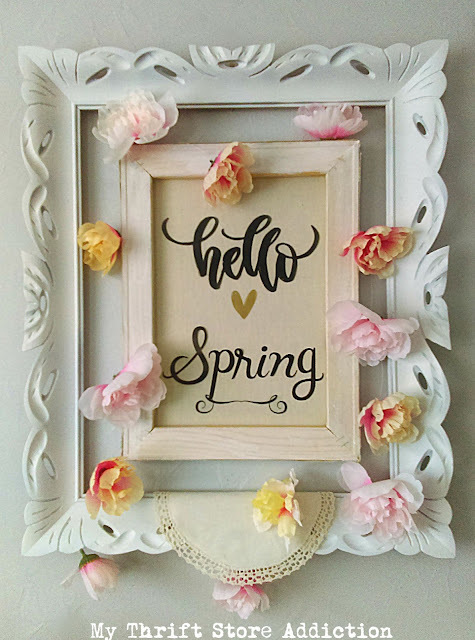 I need to take your spring home tour! 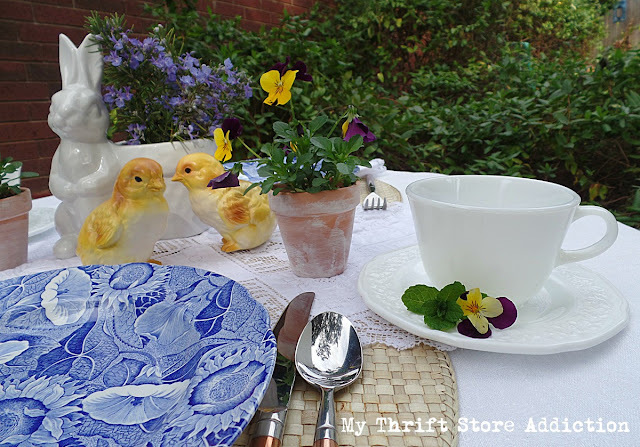 The Spode dishes are stunning!Love your beautiful table with those sweet figurines!Hugs! Cecilia, so happy that you shared this with our Garden Party!